For about three weeks, I’ve been taking the drug warfarin (approximate pronunciation WORF-uh-rin), the generic version of Coumadin. Coumadin is an anticoagulant, meaning it thins your blood to relieve blood clots in the body, and/or to prevent them from forming. It’s a powerful medicine, salvation for some people, but dangerous and potentially deadly as well. I’m taking it to reduce the chance of developing emboli in my carotid artery, or a blood clot in my brain, due to my carotid artery dissection. For me, Coumadin is reducing the likelihood of my having a stroke or other problems caused by the dissection. I’m very glad that Coumadin (warfarin) exists, and I’m grateful to be taking it, but man, it sure requires some adjustments in everyday activities. The picture above, of my arms, illustrates two important things to know about Coumadin. 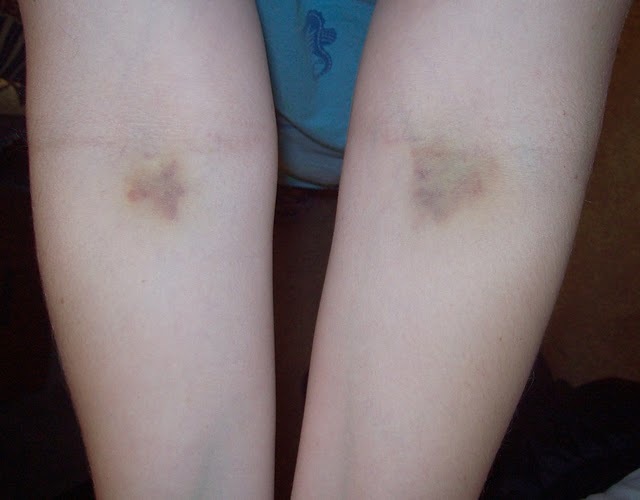 First, you will bruise easily. Second, you’ll need to get blood drawn regularly to monitor your Protime/INR level, which indicates how fast your blood clots. I had mine drawn twice a week for the first two weeks, and started a once-per-week schedule today. I’ve been on 2.5 mg per day for about ten days, and am hoping the results of today’s lab will be in the right range and not require a change of dose. Getting labs drawn regularly (more often in the first days), and adjusting the dosage, also means playing phone tag with your doctor’s office, to find out what dose you need to take that night or the next day. Again, settling into a “routine” of having lab work weekly or bi-weekly, should greatly lessen the amount of phone tag you’ll need to play. Let’s briefly review number one, “you will bruise easily.” When taking an anticoagulant, you need to be more careful of yourself. I’ve been avoiding the main area of the basketball court, before and after Kyle and Ryan’s games, trying to stay along the edges of the court, and watching for any loose balls coming my way. I’m trying to be more careful in the tight spaces around the house, to avoid bumping into furniture. Basically, I’m paying more attention to what I do, and the area I occupy, physically, at any given time, to avoid risky situations or unsafe movements as best I can. The handout I got with my prescription is full of precautions. For instance, I have to avoid eating “large amounts of leafy green vegetables,” and other foods that contain a lot of Vitamin K, because “too much Vitamin K can lower the effect of warfarin.” This is the first situation in my life where being a “vegephobic” is a good thing for me! Seriously, it doesn’t say to avoid these things, but not to go overboard on things like lettuce, cabbage, or spinach. But, it DOES say, in bold type, to “avoid drinking cranberry juice or eating cranberry products.” No explanation, just avoid them! I knew already that people taking Coumadin shouldn’t take aspirin, but I didn’t realize that ibuprofen could also interact with it. I’m now taking extra strength acetaminophen for my headaches, and took the ibuprofen out of my purse. Of course, I have to be extra-careful to try not to cut myself, and be ready to get a bandage and apply a lot of pressure to the cut if I do. Several people have already mentioned that, surrounded by books and paper, I need to watch out for paper cuts. I can’t tell if they’re kidding. I seriously doubt that a paper cut could do me in, but as I said, I know where to get a bandage in a hurry. Finally, my absolute biggest problem with taking this medicine, and I don’t care if this is “too much information,” is how it’s affecting my menstrual period. It’s no surprise that a blood thinner would have some impact on my period. I was already having a couple of really heavy days each month, and I’ve also had some between-period spotting, off and on for over two years now. Sure enough, days two and three of my period, last Friday and Saturday, were extra-heavy, and that was normal. Days four and five weren’t bad, somewhat lighter. Before Coumadin, my period was usually five days, occasionally six, but the last two days were always lighter. With Coumadin, day six was heavier than day five, and day seven was some of the heaviest bleeding I can ever recall having. Today is day eight, and not as bad as yesterday, but no picnic, I can tell you that. I still felt globs of blood coming out of me, multiple times today — TODAY, on DAY EIGHT, for crying out loud! So, I guess my point is, if your doctor feels that you really need to take an anticoagulant, prepare to make a few changes in your lifestyle or everyday activities, perhaps small changes in the foods you eat if you love cranberries or green leafy vegetables, and know the dangers of taking Coumadin, but that your doctor feels the benefits outweigh the risks in your situation. And if you’re a woman of childbearing age who still has menstrual periods, stock up on those feminine supplies, because honey, you’re gonna need them.